Montreal - André Pépin, a glider pilot from the Montreal Soaring Council, a gliding club based in Hawkesbury, Ont., achieved on Friday, April 24 a stunning 1,050 km flight. After take-off from a small airport near State College in Pennsylvania, where several pilots of the Montreal Soaring Council are on a flying camp, Pépin flew his glider for nearly nine hours in the strong updrafts created by a steady wind over the ridges of the Allegheny Mountains. Flying without engine at an average speed of 120.5 km/h he covered a non-stop distance which is the equivalent of a round-trip Montreal-Toronto. After 8 hours and 42 minutes of flight he landed at the same airport where he started from. “It was an incredible day at the ridge,” Pépin said. “I could not resist stopping sometimes in thermals averaging 800 to 1,000 feet per minute climb rates. It was another day in paradise!” The epic 1,050 km flight was only Pépin’s third flight in his new glider, a LAK-17B FES 21m. It is a 21 meter wingspan high-performance single-seat glider manufactured in Lithuania and the first of this type that has been delivered in North-America. “We can say it was a real shake down for the ship!” Pépin said. Gliders, or sailplanes as they are sometimes called, have no engine but stay aloft using rising air currents created by various weather phenomena. Heat from the sun creates thermals, bubbles of rising warmer air. Glider pilots fly in tight circles in these thermals to climb, much like eagles and hawks do. By flying from thermal to thermal, glider pilots can sustain their flight for hours and cover hundreds of kilometres. Soaring, as this form of motorless flight is called, is practiced in Canada by almost 1,500 pilots. The sheer beauty of soaring and the challenge of finding and using rising air currents are what get most glider pilots hooked to this unique sport. Pépin is an accomplished glider pilot. He started flying at age 17 and has accumulated more than 6,400 hours in 58 types of gliders. In 2014, Pépin claimed the top spot in the Ontario and Quebec ranking of the Online Soaring Contest, a decentralized competition run via the internet with daily scoring based on GPS flight recordings and in which glider pilots from all over the world participate. The Montreal Soaring Council is one of the larger gliding clubs in Canada and flies since 1957 from its home base airfield in L’Orignal, a township near Hawkesbury, Ont. The gliding club counts about 75 active members and operates almost daily from May until October. 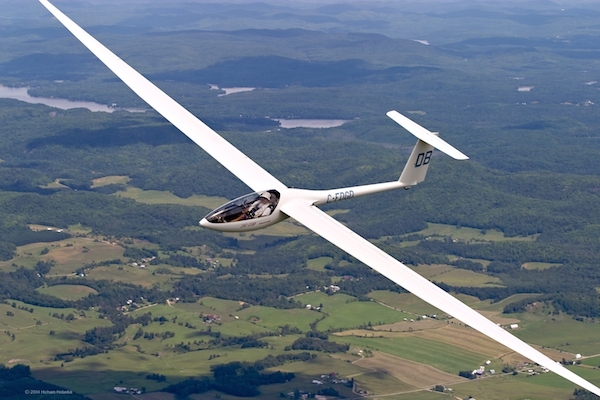 Montreal Soaring Council is a non-profit organization and provides initial and advanced glider pilot training for its members as well as introductory flights to anyone interested to experience the thrills of motorless flight.